The Gantimpala Theater announces its 36th theater season for 2013-14 with film and TV director Joel Lamangan as the new artistic director. This season offers the four (4) Tagalog Classics and two (2) new touring musicals, Ang Prinsepe at ang Pulubi and Katpunan: Mga Anak ng Bayan. The multi-awarded film and TV director takes over the position of the late Tony S. Espejo, founder, president and artistic director of the dramatic arts company for the past thirty-five seasons. The press conference was held recently at the Café Ysabel in San Juan City. The first installment of the Four Classics begin this August with Florante at Laura, which written originally as an awit by Franciso Balagtas. This Philippine literary masterpiece, transformed into a play by Bonifacio Ilagan, highlights the story of a quartet of lovers - Duke Florante and Prinsesa Laura of Albania, Prinsepe Aladin and Flerida of Persia. 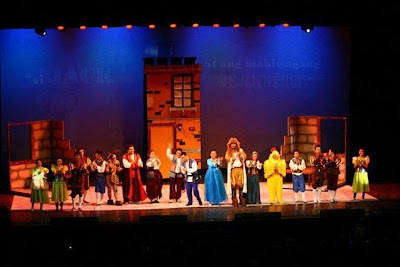 It is also presented as a komedya, a Filipino theater form. Performances are on August 2, (9am/12nn/3pm), SM Southmall Cinema 3, Las Piñas City, August 9 and 10 (10am/2pm), Star Theater, Star City, Pasay City and August 16 and 17 (10am/2pm), AFP Theater, Camp Aguinaldo, Quezon City. Kanser, written by Jomar Fleras, is a play based on Noli Me Tángere. The novel’s most iconic characters come alive on stage. The longest-running Filipino theater production earned a nomination last year as Best Filipino Play (New/Revival) category from Broadway World Philippines. Performances are on August 30, 31 and September 1, (9am/12nn/3pm), AFP Theater, Camp Aguinaldo, Quezon City, September 6, 7 and 8, (9am/12nn/3pm), Star Theater, Star City, Pasay City and September 12 and 13, (11am/2pm), SM Southmall Cinema 3, Las Piñas City. Ibong Adarna is a korido about a magical bird with a very long fancy tail, that changes into seven colors – ruby red, sunset orange, peach yellow, emerald green, satin blue, velvet violet, and deep indigo. These colors represent songs that serve as a cure for all types of afflictions. Playwright Ed Maranan presents the three dons Pedro, Diego and Juan and the many adventures they encounter in capturing the one bird that lures them all. Performances are on September 27, 28 and 29, (9am/12nn/3pm), AFP Theater, Camp Aguinaldo, Quezon City, October 3 and 4, (11am/2pm),SM Southmall Cinema 3, Las Piñas City, and October 11, 12, and 13, (9am/12nn/3pm), Star Theater, Star City, Pasay City. Rounding up the Four Classics is El Filibusterismo, the sequel to Noli Me Tangere, penned by Jomar Fleras centers on the enigmatic stranger Don Simoun, the affluent jeweler, moved by hatred and a fierce desire to avenge his sufferings, and to rescue Maria Clara from the nunnery where she has fled for sanctuary. He embarks on a crusade that aims to corrupt and weaken various institutions that eventually lead to a bloody revolution. Performances are on October 15, 16 and 17, (9am/12nn/3pm), AFP Theater, Camp Aguinaldo, Quezon City, November 22, 23 and 24, (9am/12nn/3pm), Star Theater, Star City, Pasay City, and November 28 and 29, (11am/2pm),SM Southmall Cinema 3, Las Piñas City. 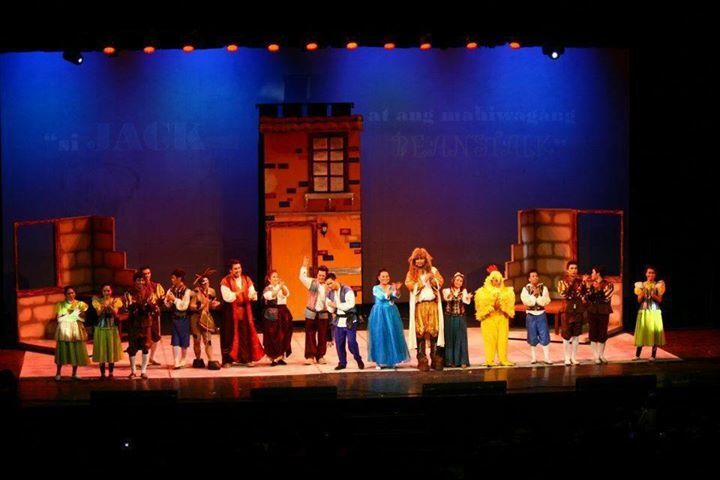 The first touring musical Ang Prinsepe at ang Pulubi, is based on Mark Twain's classic, The Prince and the Pauper. This new Filipino musical tells the tale of two young men - male heir to the throne of England, Edward Tudor, son of Henry VIII and the other, Tom Canty, the unloved son of a beggar and thief. Born on the same day, the duo trade clothing one afternoon and, as a result, they trade lives as well. After many adventures, matters are set right - with one of them resuming his rightful, royal position and the other accepting a position that recognizes his innate intelligence and good heartedness. Performances are on August 8, 9 & 10, Angeles University Foundation, Angeles City, Pampanga; August 14, 15 & 16, Bren Guiao Cultural Center, San Fernando, Pampanga; August 23, in Laguna; August 28 & 29, Olongapo Convention Center, Olongapo City, Zambales; September 14 & 15, Ortega Gymnasium, San Fernando, La Union. Metro Manila shows will be on January 17 and 18, 2014, (9am/12nn/3pm) at Star Theater, Star City, Pasay City, and January 23 and 24, (11am/2pm),SM Southmall Cinema 3, Las Piñas City. Katipunan: Mga Anak ng Bayan – the very first Bulwagang Gantimpala production written by multi-awarded playwright Bonifacio Ilagan with musical numbers created by award-winning musical composer Maestro Jesse Lucas, will be the second touring musical. It presents the short life and turbulent times of the working class revolutionary Andres Bonifacio and his wife, Gregoria "Oryang" de Jesus. It illustrates the evolution of the mass-based revolutionary organization, the role of women in the struggle, the internal conflicts that weakened it and the lessons that we realize and bring to heart. Partners for this season are the National Parks Development Committee, Ever Bilena, Skin Sanctuary and Aces and Pros. For tickets and bookings, please call 9985622 or 8720261.